Before our bike ride began I was in Bangkok, intent on sight-seeing. I decided on the amulet market, close to the Grand Palace, intending to see some of Bangkok and purchase some good luck for our trip. Protection comes pretty cheap in Thailand, I bought ours for less than 150 Baht (£3.15). But I know you can’t really buy good luck. In the UK we use images of four leaf clovers and black cats simply as gestures, images of superstition gone by. However, superstition is very much alive in Thailand. They say that times have been hard; society has shifted from agriculture to industry, insecurity has grasped the nation and in turn they have grasped Buddhism and superstition. But are these one and the same? 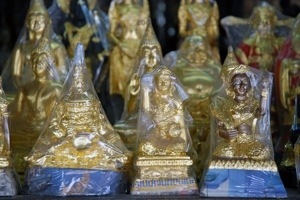 The amulet market is exactly that; a street market and labyrinth of covered stalls that sell amulets (or phra kruang). Stall after stall displays small figures – Buddha, the revered King and Queen – either fashioned from metal or clay or encased in glass. Some of the figures are animals or objects; this is where I found the spider and the turtle. As the spider spins its web it traps within it all the good fortune and prosperity that is owed to the owner for their effort. The turtle, emblematic of earth and water represents good luck, and good health, insinuated through his long life span, pleasant and non-aggressive nature; or so they say. 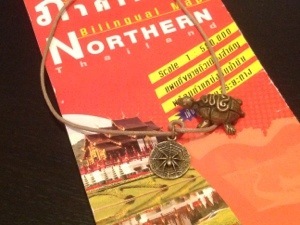 I was pleased and a little fascinated by my new trinkets, but was still curious about what they really meant to the Thais. I read that those in high risk professions, taxi drivers for instance, purchase the amulets as protection. Get in any cab in Bangkok and you are likely to see small figures on the dashboard, central, just below the rear view mirror. If you look up you will see stains on the ceiling where incense has been burned as the vehicle was being blessed. Many Thais wear the amulets around their necks, which is where my spider can now be found. I like it there and I like a little superstition and myth, it adds texture to life, so long as you don’t rely on it. So, I wondered how what seemed a deep rooted superstition could be part of the Buddhist religion. Apparently, the practice of stamping religious images onto amulets came over from India, entering Thailand, with Buddhism, in the sixth century. The popularity grew in the 1800s and it retains that popularity today. Enter ‘Thai Amulet’ into eBay if you don’t believe me. One of the most important things about amulets is their manufacture – of course it is, especially in the land of knock-off goods. The real ones are manufactured by monks, their blessing, rather than their handicraft being the crucial bit. Some say the monks increase manufacture when they are in need of extra funds. Once the amulet has been created it is not unlike a race horse, because dependent on its performance (in this case being the good luck and prosperity delivered to its owner), its value increases astronomically. Speculation takes place on the future value of specific amulets, as others might speculate on the performance and value of an animal. Somebody is getting rich. So the origin of the amulet is the Buddhist monk, yet at the same time they are shrouded in speculation, material wealth and superstition. I was confused. As I embarked on my travels I knew I wanted to find out more about Buddhism; an ancient philosophy used increasingly in modern counselling and well-being techniques. I discussed my ideas with other people before I left, sometimes with guests at the ski chalet who asked where I was going next. I arrive in Thailand and find contradictions to all the philosophical ideals I wanted to believe in; great wats stand among otherwise modest dwellings, they cut the skyline with huge glittering roofs, ornate golden effigies, statues, carvings, huge Buddhas that stand stories high observing the highways from a grassy field. What are these for? 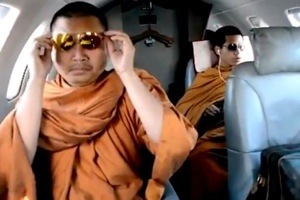 Monks manufacture protection and good luck in the form of icons, they carry laptops, have smart phones and wear designer sunglasses. I thought their life was a simple one apart from the materialistic society that screws us all up, but perhaps society’s demands have got bigger than their ideals. I mean, I have no idea how I would manage without WIFI, tablet and smartphone. A fascinating, but extreme case. This is likely isolated, but I have come no closer to understanding a belief system that I wanted or needed to believe in. And what of the spider and the turtle? Well, the turtle bore Nick, his owner, on a safe journey. Not one puncture, no despairing episodes by the side of the road and he was pleasant and patient enough to bear mine. The spider is a different story, with a puncture tally of six overall, I am not sure what Mr Arachnid was doing at those crucial moments. But perhaps there were worse fates that I did not suffer. I mean, I only saw two cockroaches and finished the ride without one mosquito bite. Plus, as I navigated my way from town to town, I did not get significantly lost once; so perhaps I am doing the spider a disservice. I still wear it.